Quarter end today. From a time perspective, Monday (today), Tuesday and Wednesday represent a window of opportunity for a high. From a price perspective, today's price structure could be small-degree bullish flat pullback. 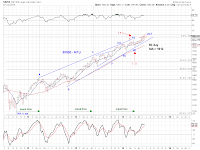 See charts and Monthly Outlook Update (6/27/14) for additional discussion. Although stocks keep subdividing higher making marginal record highs, we expect stocks to top before long. 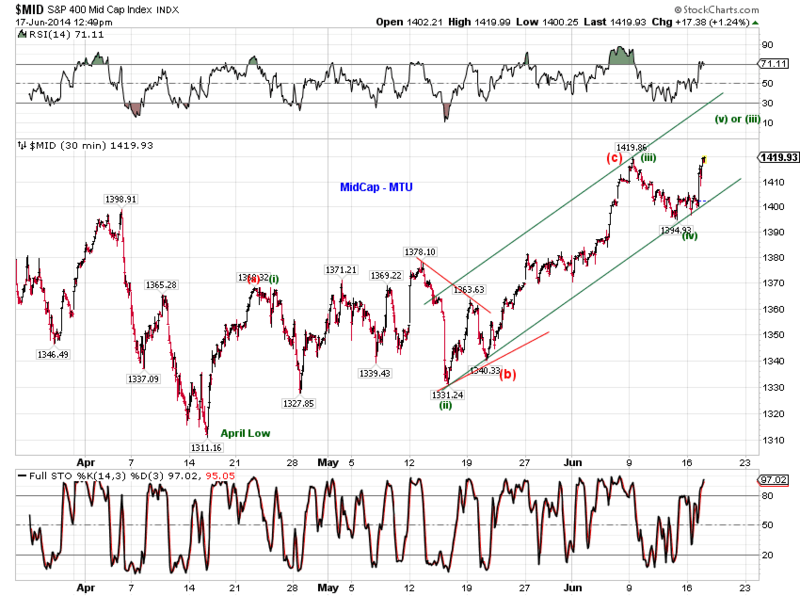 Price actions in June introduce some interesting topping scenarios. 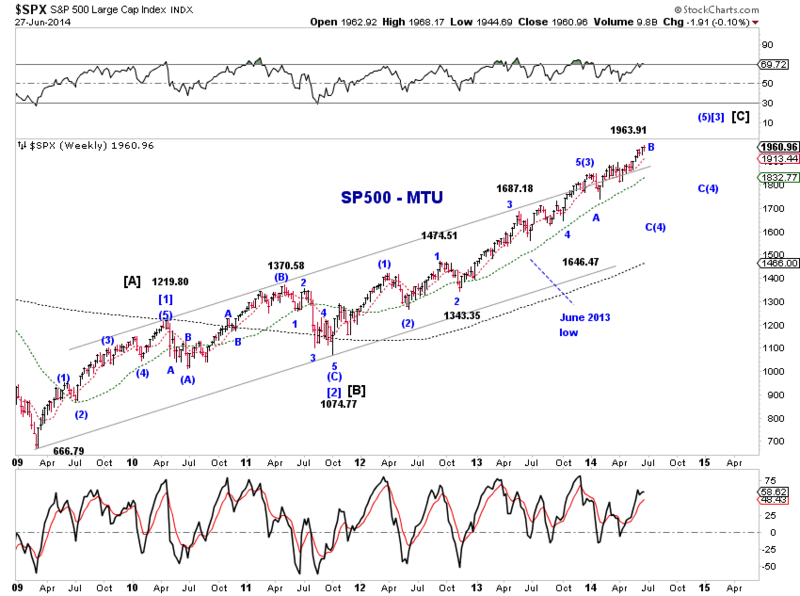 The blue count in Chart 1 outlines a large EDT in SP500 since the October 2013 low, which we have been tracking for some time . It is capped at 1974 according to rules of a contracting EDT. It is possible that the final wave (c)-up of [e]-up is itself a small EDT. See the blue count in Chart 2. Since an EDT is a terminal pattern, we effectively have a small terminal pattern within a large terminal patter, which is fitting for a top. 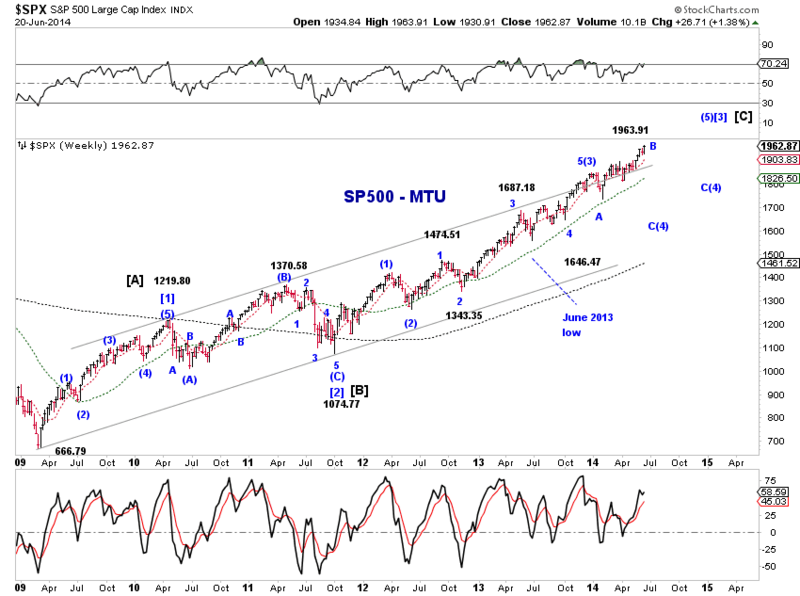 A zigzag pullback in June following a three-wave advance since the April low suggests that the Dow may be tracing out an EDT since its February low (Chart 3, upper panel). 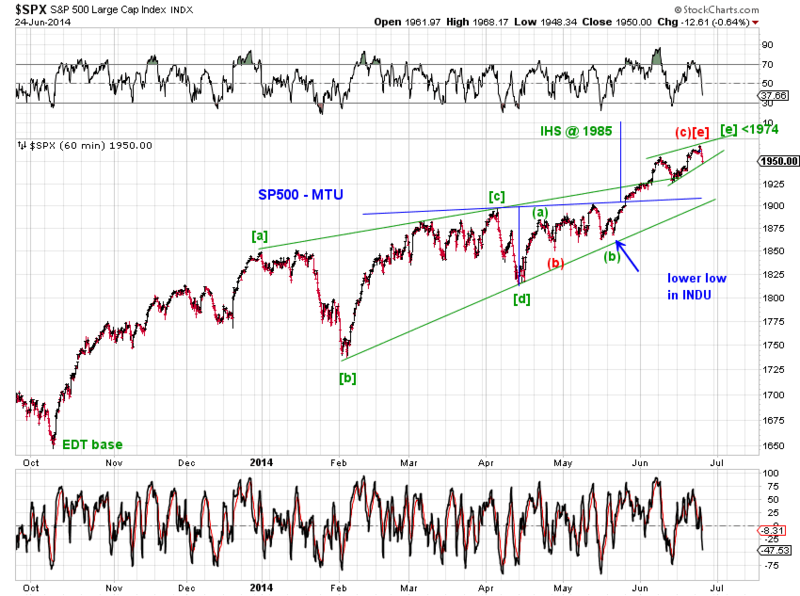 In fact, this structure can be mapped into SP500 (Chart 3, lower panel). 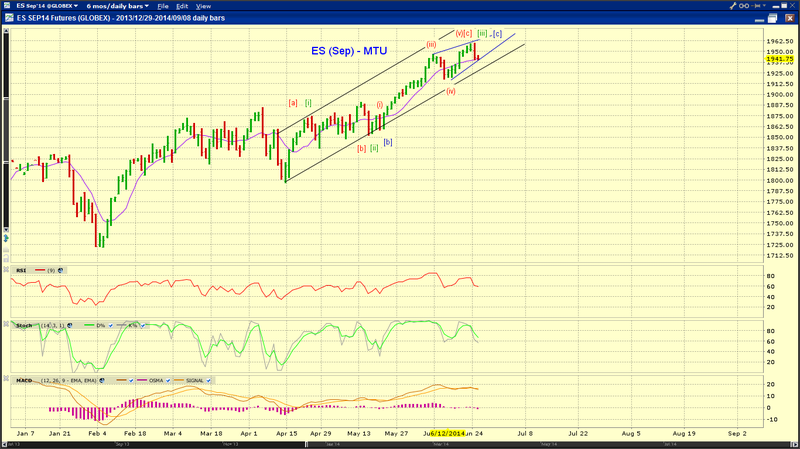 Chart 4 shows this EDT may be the final wave (c) of [Y]. Price actions in the Russell2000 index suggest the possibility that stocks actually topped at the turn of the year and the 2014 gyrations are part of an expanded consolidation that still requires a final major pullback. 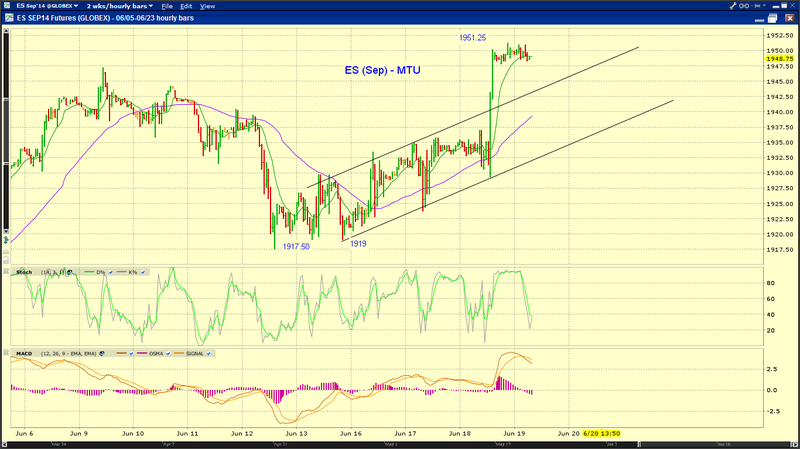 Chart 5 (upper panel) shows this structure in RUT and Chart 5 (lower panel) shows how it is mapped into SP500. 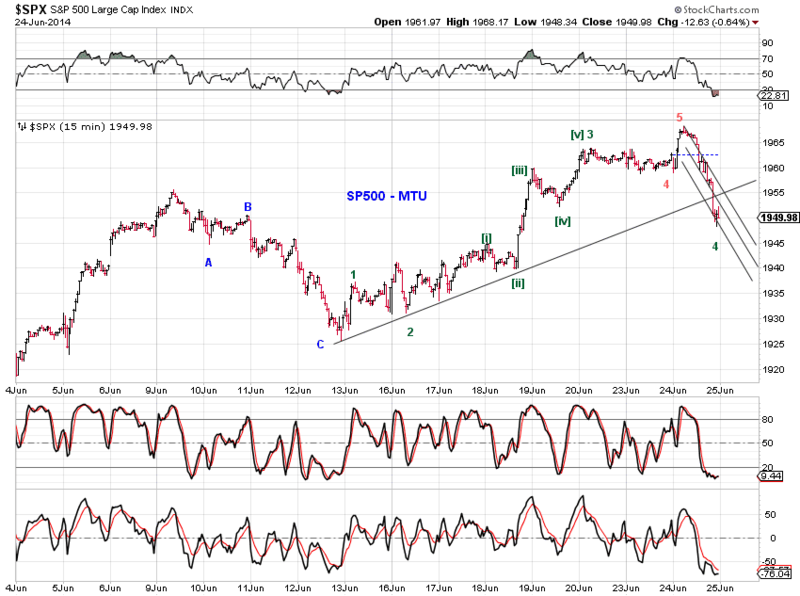 Chart 6 shows this expanded consolidation may be a wave (4)-down as indicated. 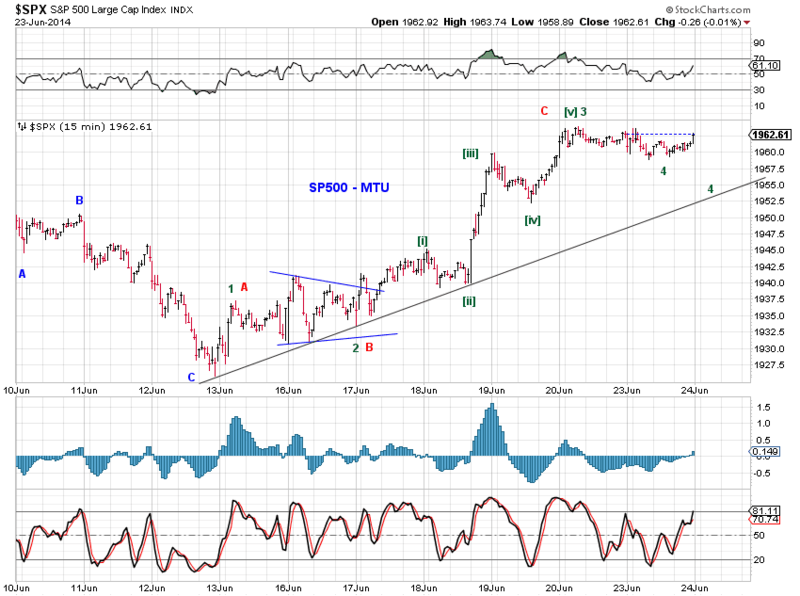 Under this scenario, the Q2 upswing in stocks is wave B-up of this consolidation. Wave C-down is straight ahead. If the bullish sentiment prevails, a lengthy sideways move (triangle or diamond) is likely (for most if not all of 2014). 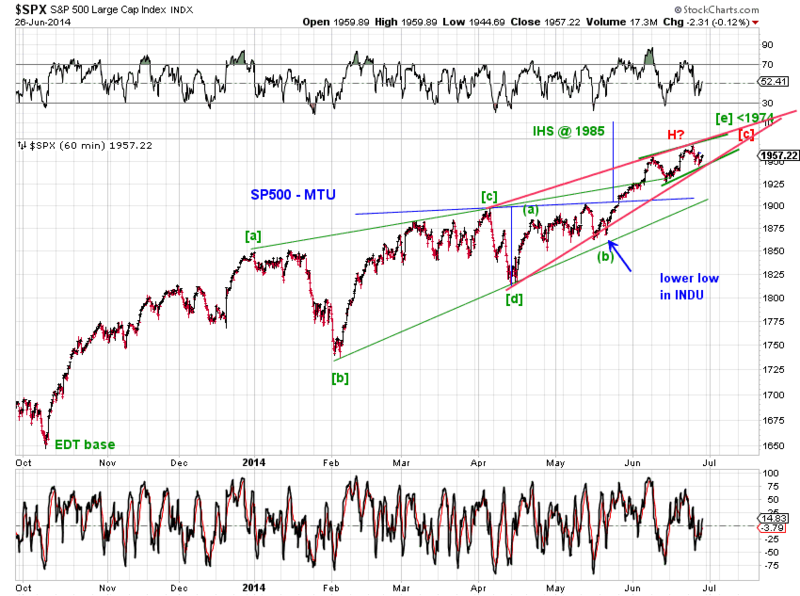 Otherwise, wave C-down is likely to break the February low (1739.66 in SP500). 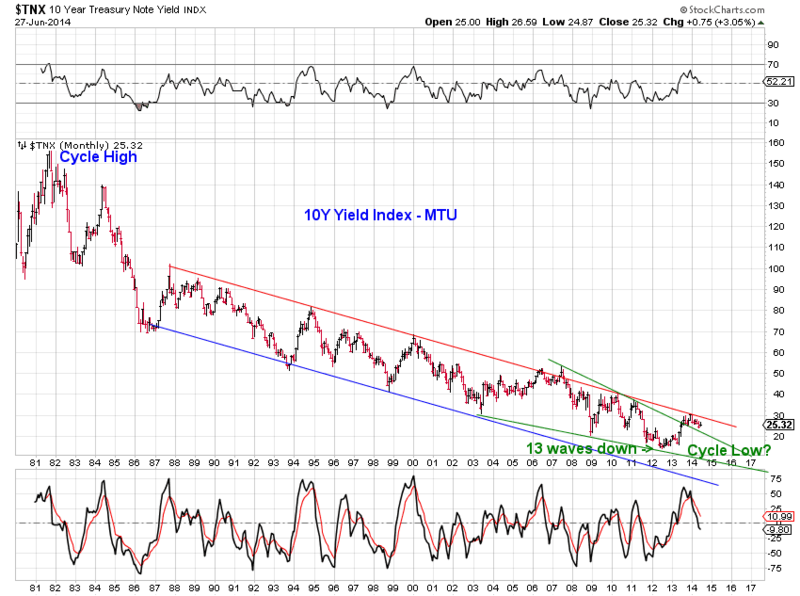 As discussed in the previous Monthly Outlook Update (5/30/14), the 2014 rally in long term U.S. Treasuries simply reflects the strong trend-line resistance that has guided long term U.S. rates for decades (Chart 7). The low in rates at the end of May has held. 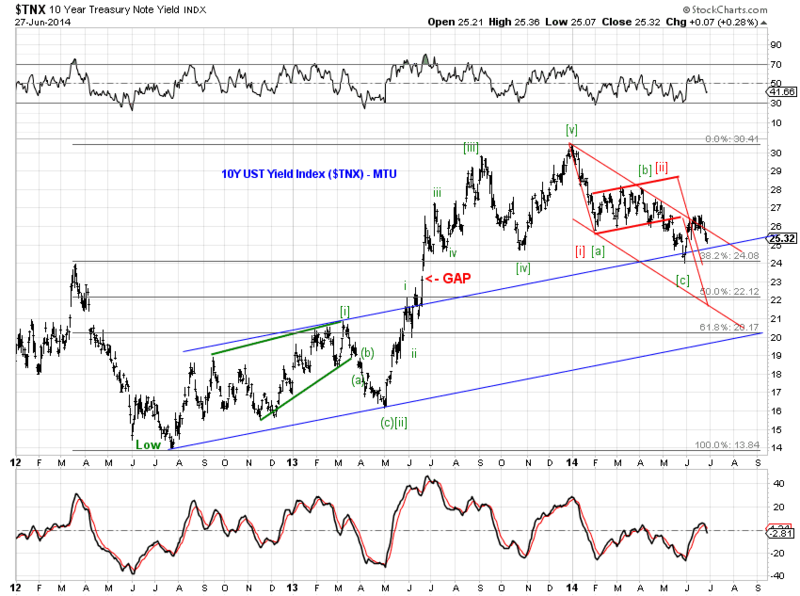 10Y yield rebounded not only off the green upper EDT line in Chart 7 but also off the blue base channel in Chart 8. 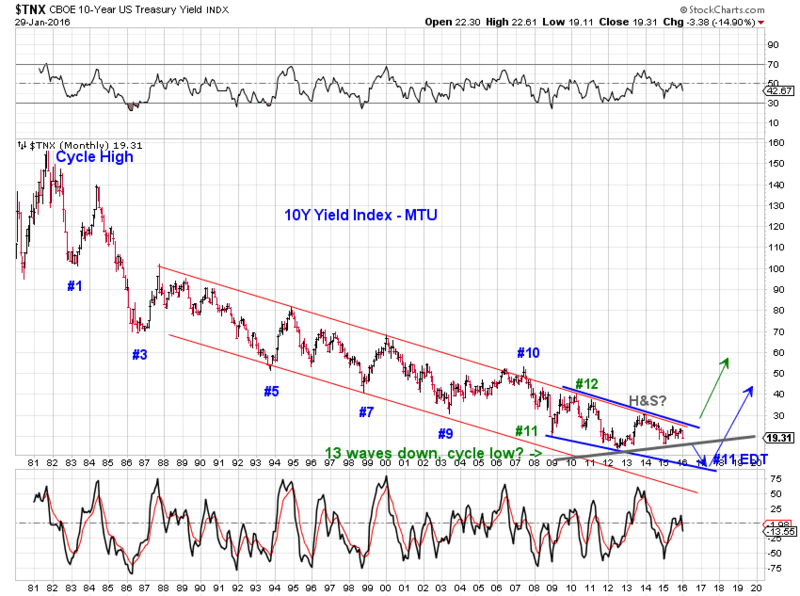 As Chart 7 illustrates, any meaningful move in rates will have to breach either the red line or the green line first. 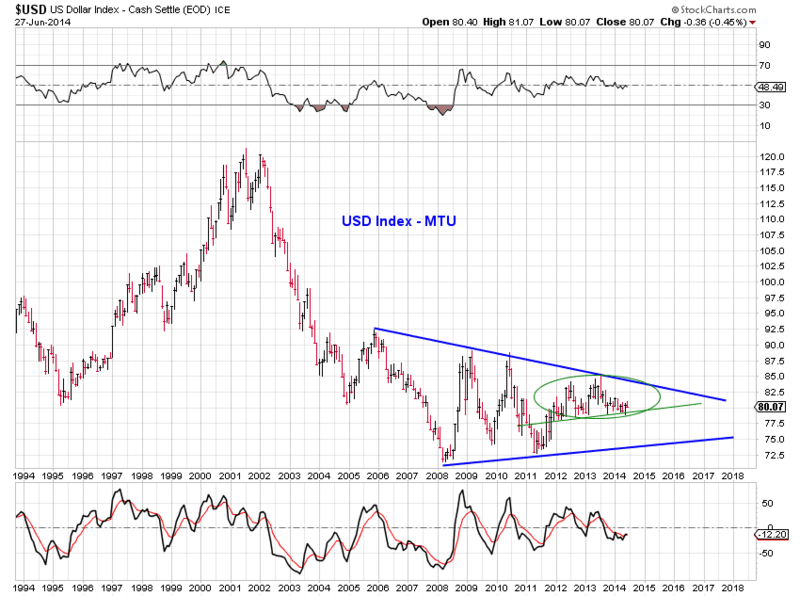 Odds continue to favor a higher USD index for the balance of 2014 as long as the green support line in Chart 9 holds. 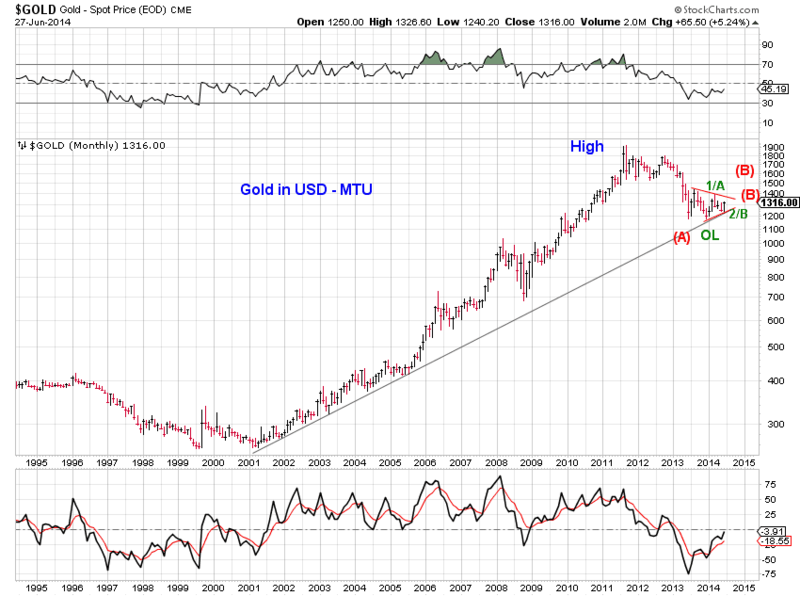 Please see our analysis and discussion in Monthly Outlook Update (5/30/14). 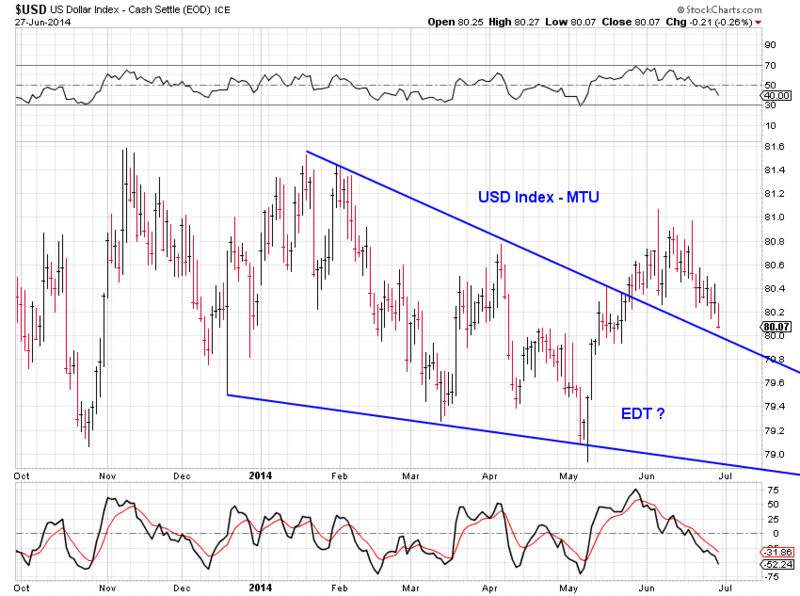 Chart 10 shows that the USD index is retesting the support from a prior EDT for a second time in June. 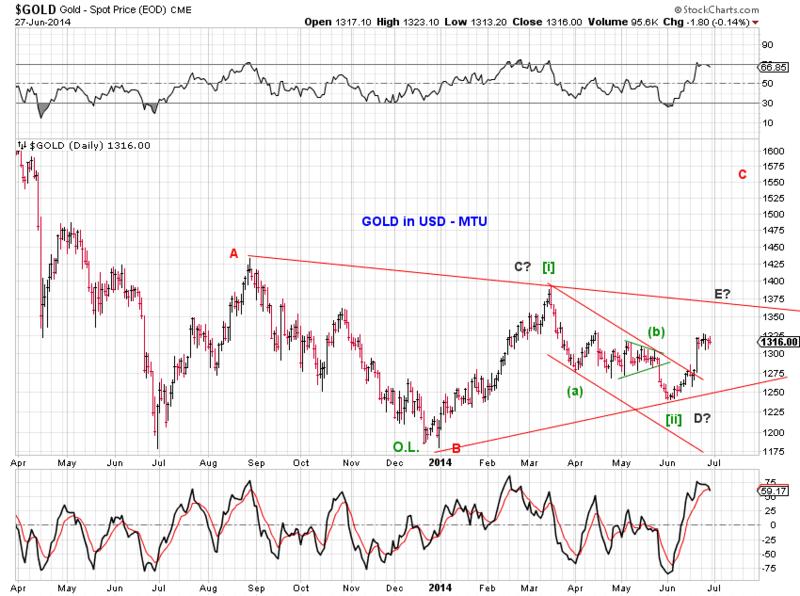 There's no change to the two key tracking scenarios on Gold. 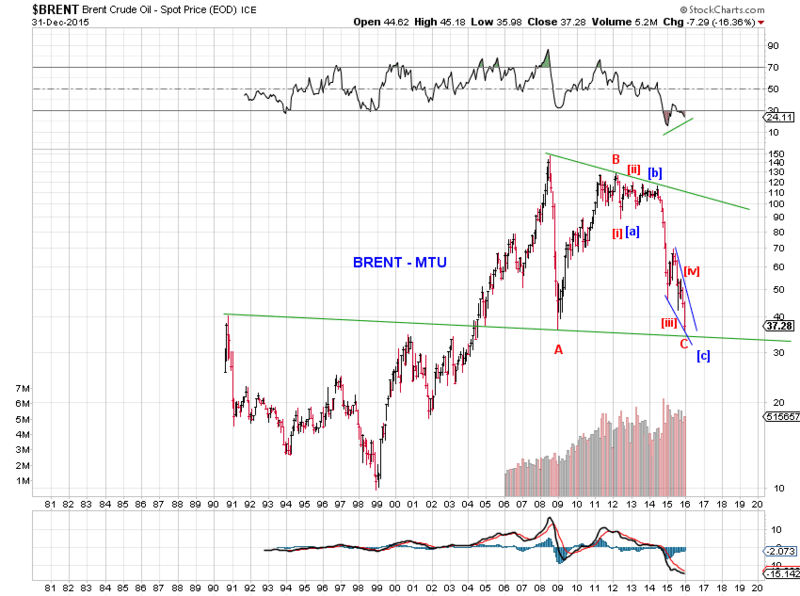 The rally in June is in line with these scenarios. 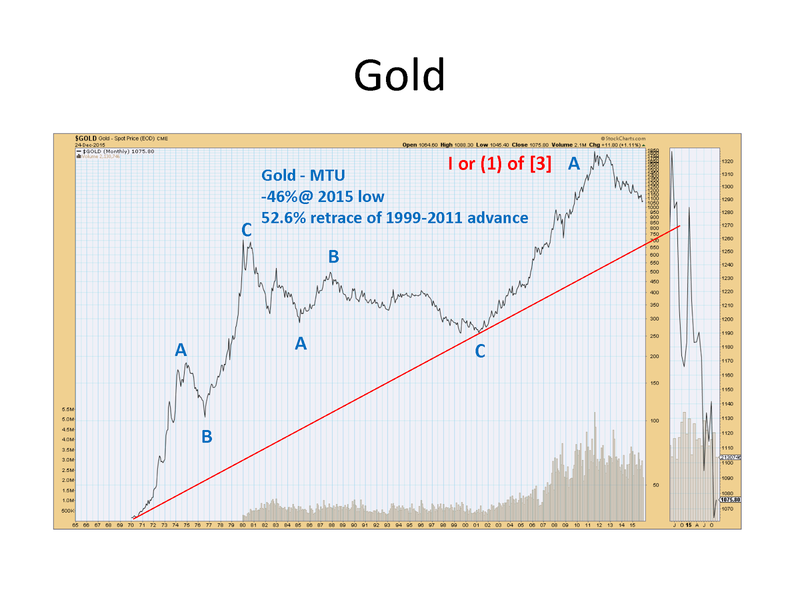 Chart 11 and Chart 12 update and illustrate. 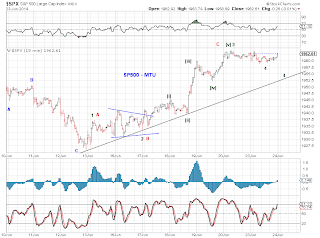 [red] an initial low at the beginning of 2013, followed by an upward flat whose C wave has the potential to extend. 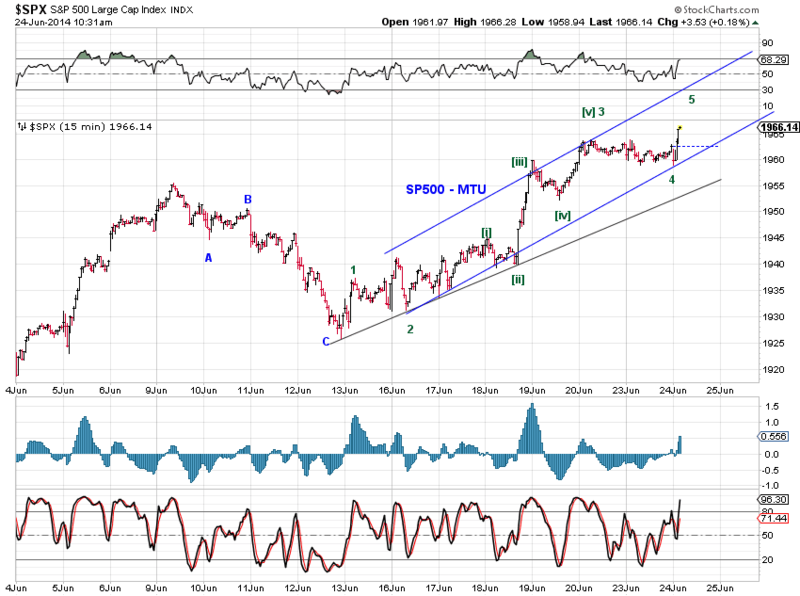 Please note that if the market decides to consolidate sideways, a triangle wave (B) is likely concluding and wave E of (B) is in progress. 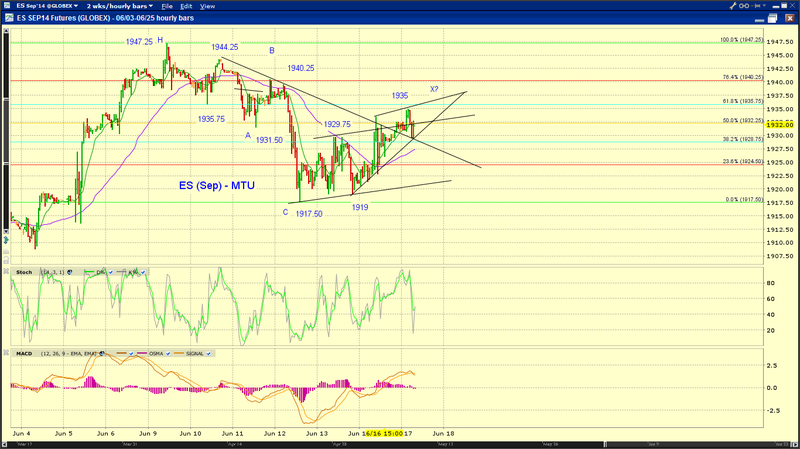 Gold needs to break above 1400 to invalidate this possibility. [green] an orthodox low at the end of 2013. Whether it is the low won't be confirmed for a while. 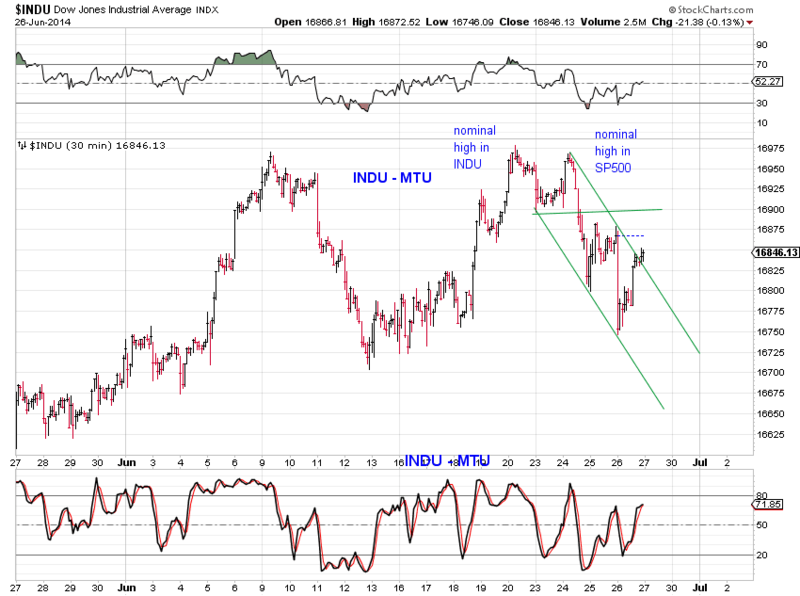 First the Dow, the lower low this morning produced a visual five down in the INDU (Chart 1). 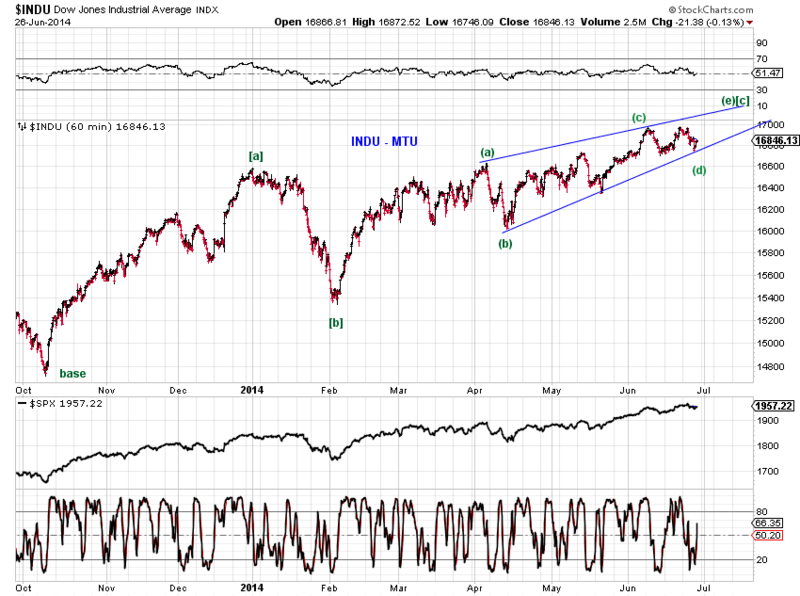 Has the Dow topped or is the recent pullback an ending wave of a larger EDT since February? (Chart 2). 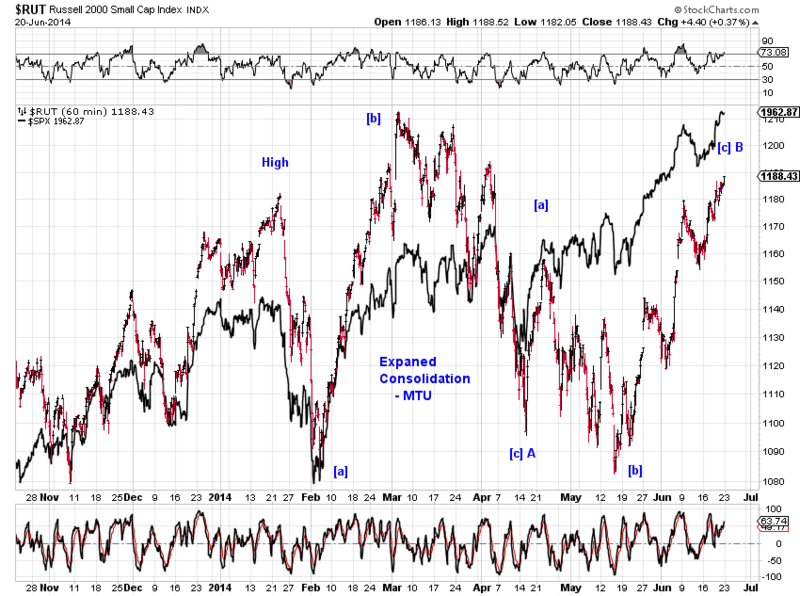 Chart 3 maps the proposed EDT in INDU into SPX. A decent pairing. In the meantime, the red trend line in Chart 4 presents potential resistance to SPX. 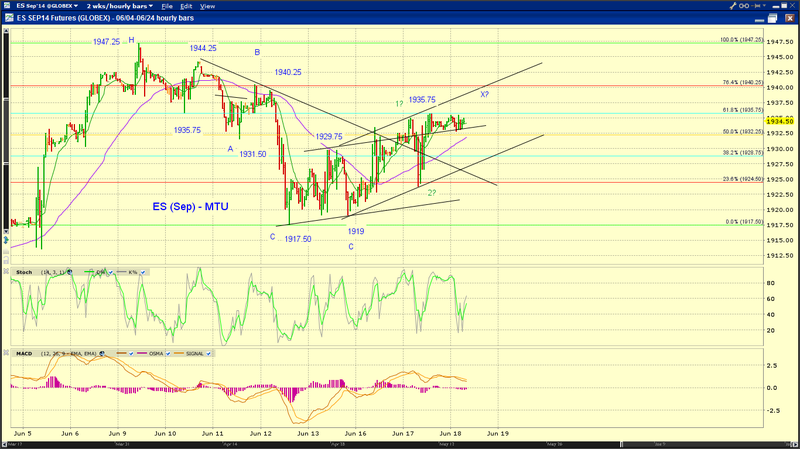 See yesterday's EOD update for discussion. 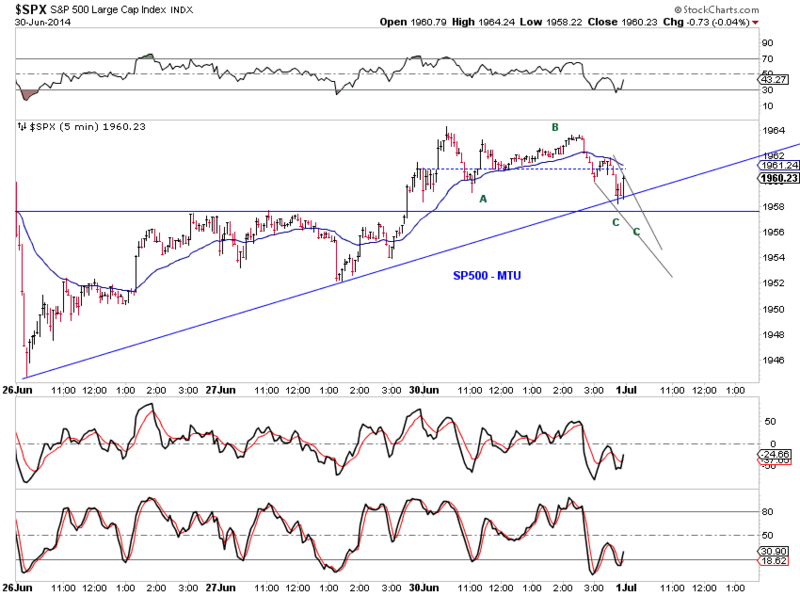 The afternoon selloff was swift, but remained a three wave structure to the day's low. If the current advance has not topped, today's development leaves several interesting possibilities. Perhaps the most interesting one is the possibility that waves will indeed resolved themselves with a small EDT within a large EDT (Chart 1, green). 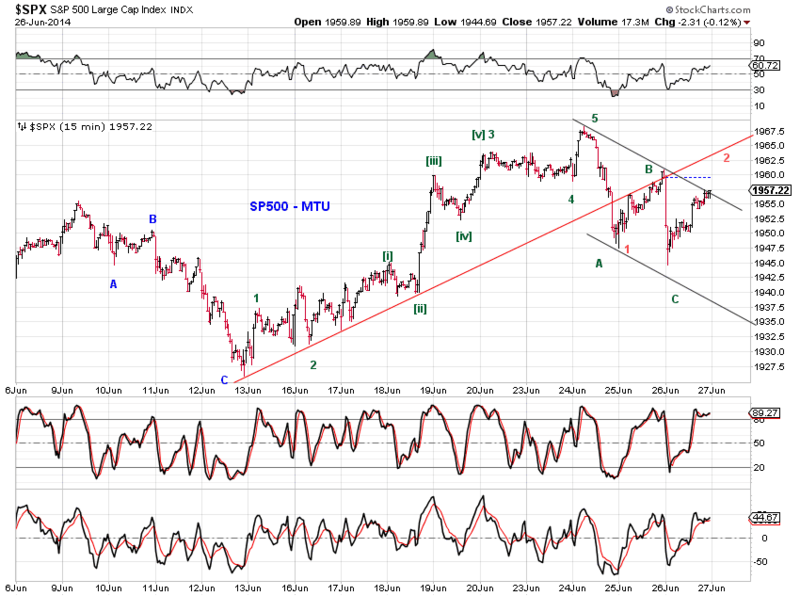 In this case, today's sell-off is wave d of (c). 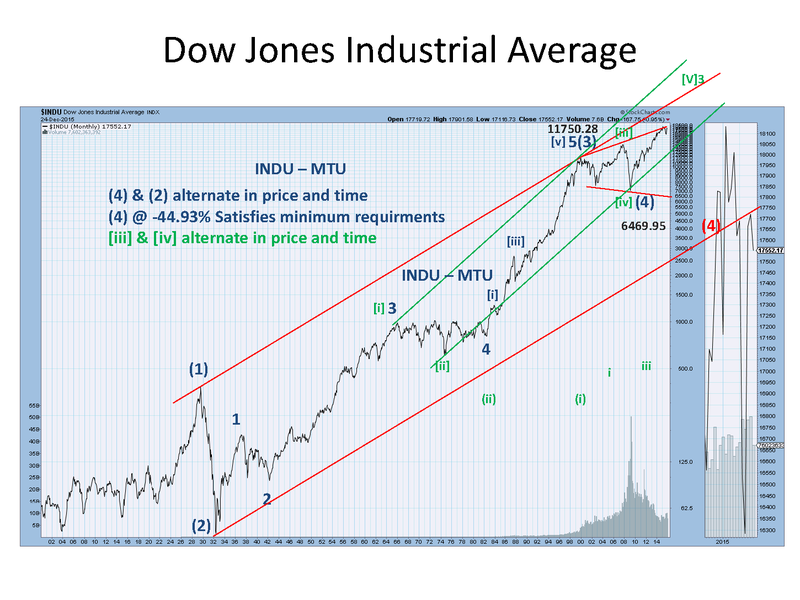 It is also possible that today's selloff is a small-degree wave 4 (Chart 2 green) of the final subdivision or wave 2 of an extension (Chart 2, red). New record highs in stocks this past week dismissed the early June high as a top of any significance. At the moment, the Russell 2000 index is the only lagger at 2.05% below its March high while other indexes made marginal record highs. 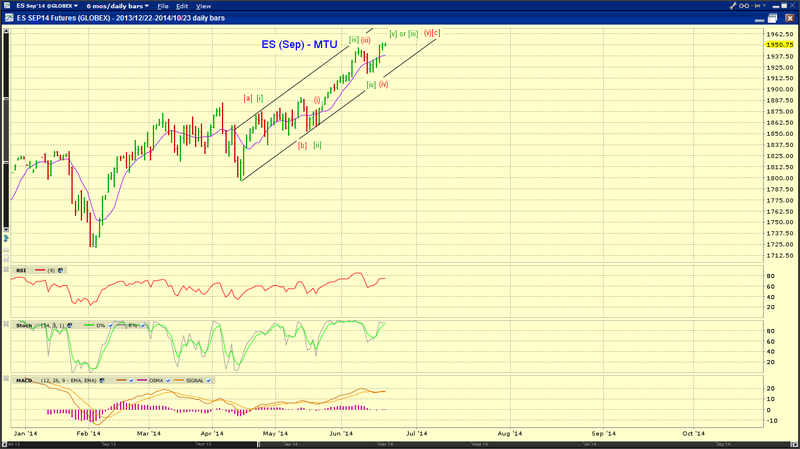 This could suggest additional upward subdivision with minor pullbacks for the current upswing. The bullish run appears to be tireless, particularly with realized vol dropping to around 5% per annum and implied vol to around 10%. Curiously, the proposed ending diagonal triangle in SP500 remains intact from a price perspective despite higher highs (Chart 1). 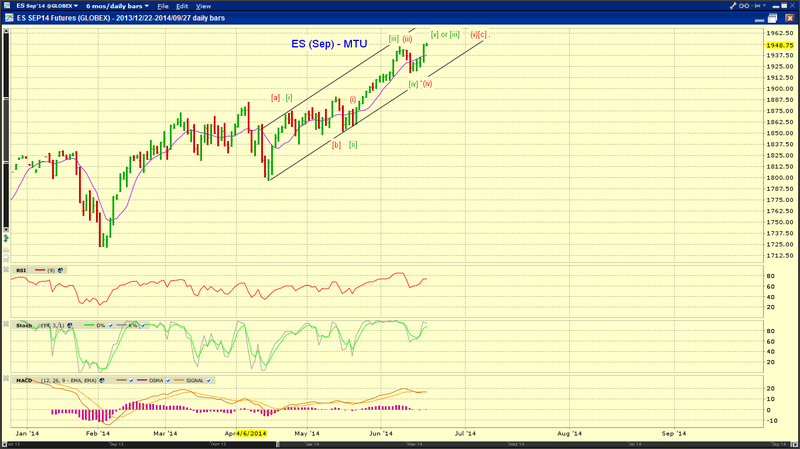 Currently, SP500 stands below the maximum level associated with the EDT. 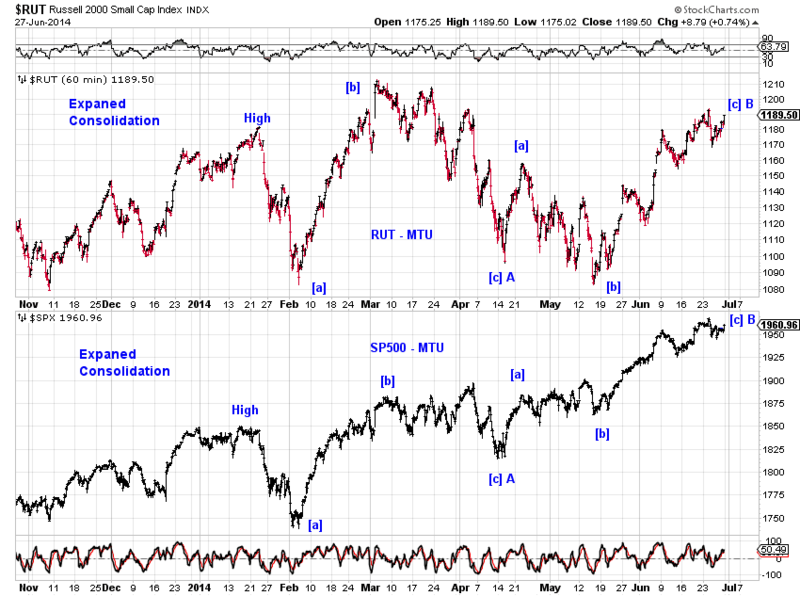 In addition, technical signs of overbought conditions are present. 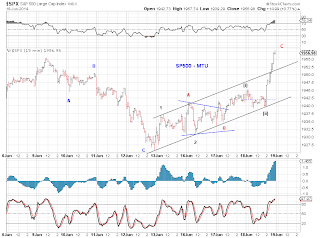 It should be noted that the wave count associated with (c) of [e] in Chart 1 appears forced, but is not impossible. 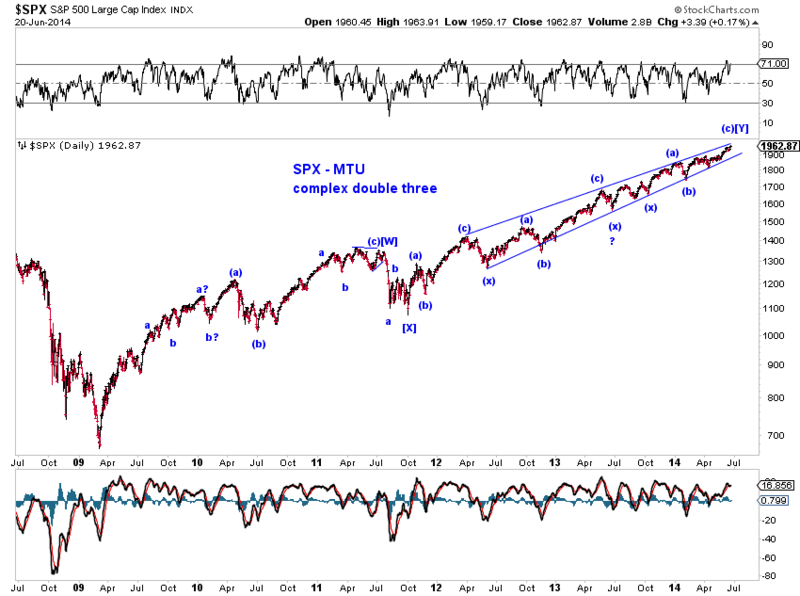 The complex double three count on the rally since 2009 may be a better fit (Chart 2). This past week's upswing represents a proper overthrow in this case. 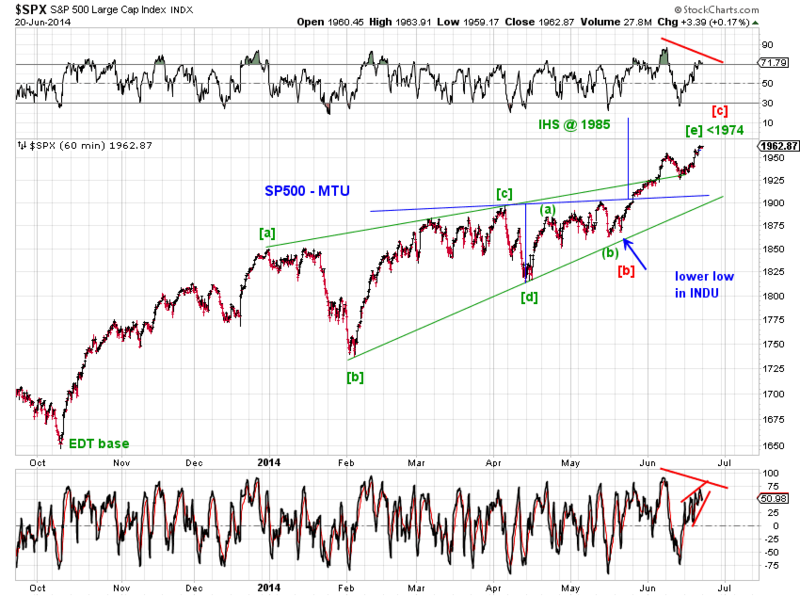 Each count (Chart 1 or Chart 2) suggests exhaustion, and te market could turn at any time. 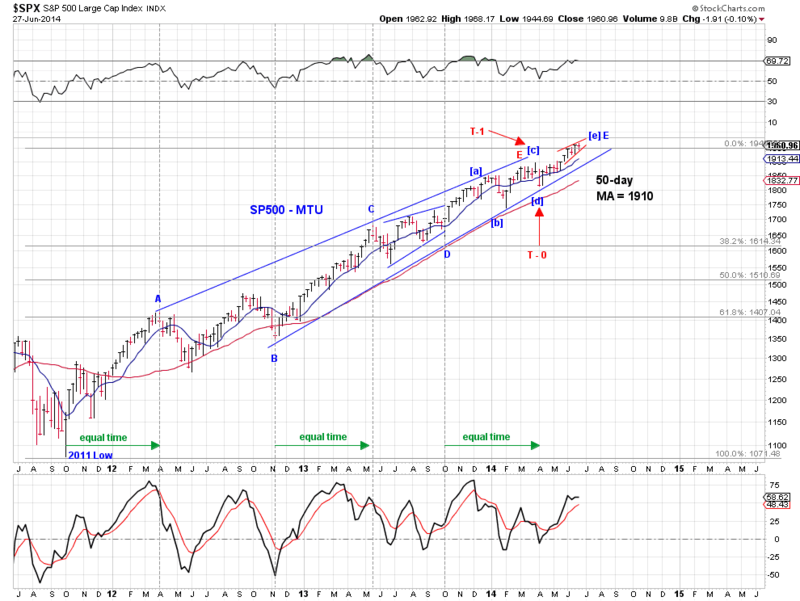 A breach of the recent low around 1925 in SP500 would be an indication of a potential turn. 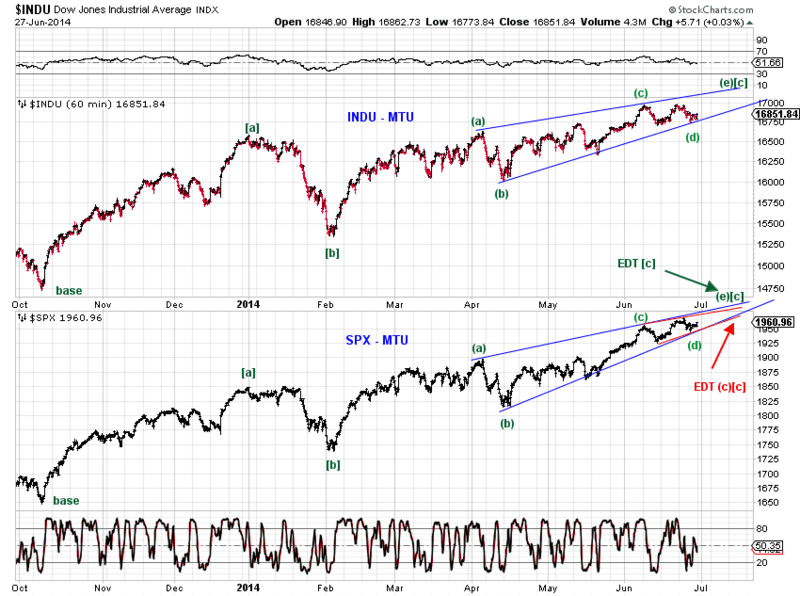 The above perspectives lead to another interesting possibility that represents a bull and bear trap. 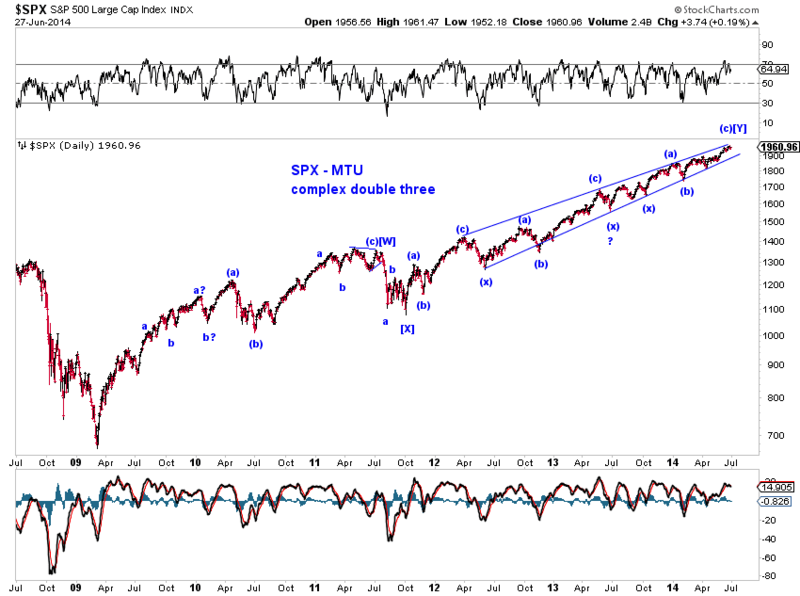 What if the market topped at the end of 2013 and the 2014 gyrations are part of an expanded consolidation that is still missing a final (major) pullback? 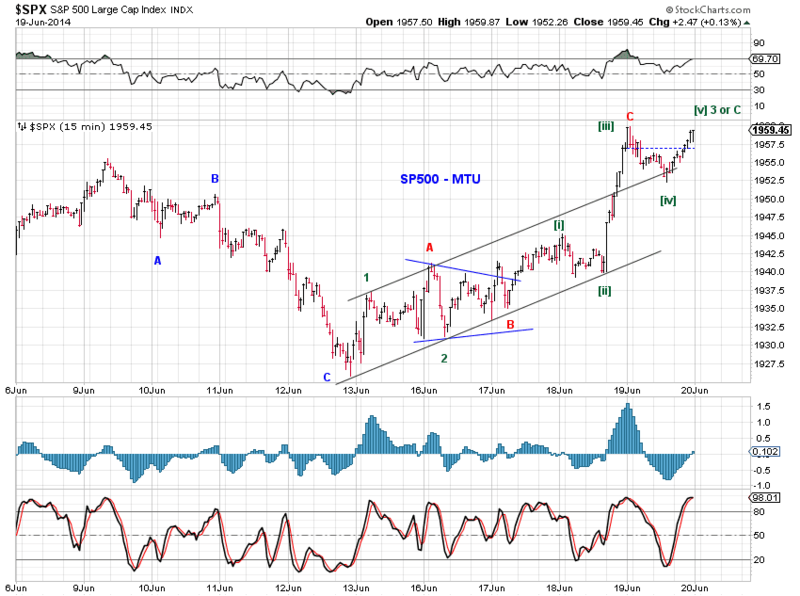 We illustrate the proposed scenario with SP500 and the Russell 2000 index (Chart 3). 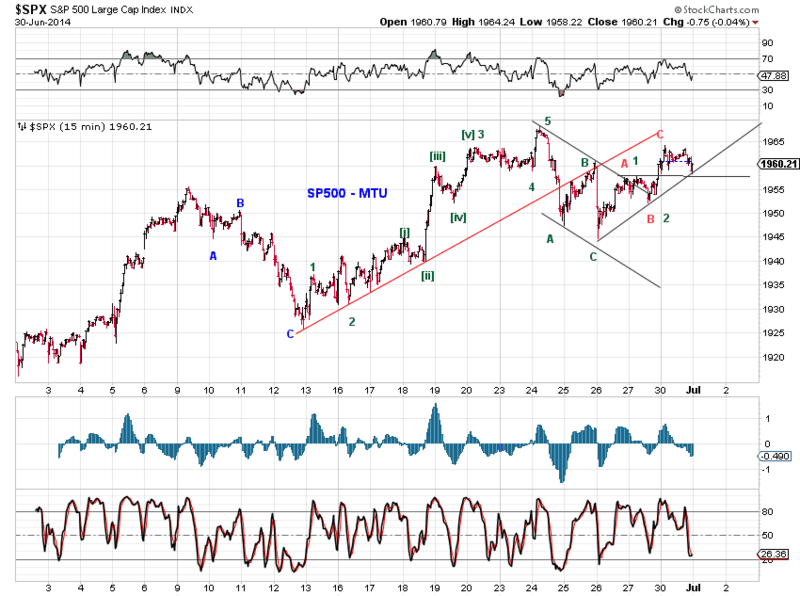 Under this scenario, the Q2 upswing in stocks is wave B-up of this consolidation. Wave C-down is straight ahead. 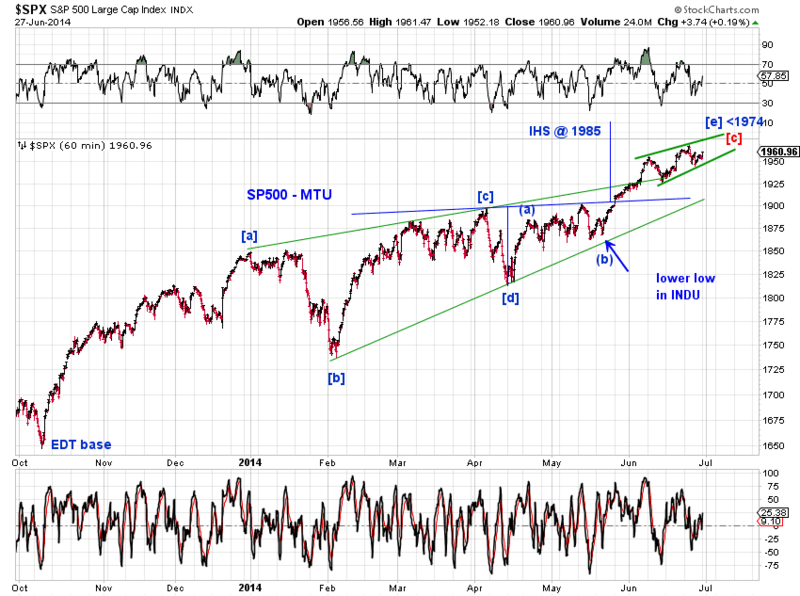 If the bullish sentiment prevails, a lengthy sideways move (triangle or diamond) is likely (for most if not all of 2014). 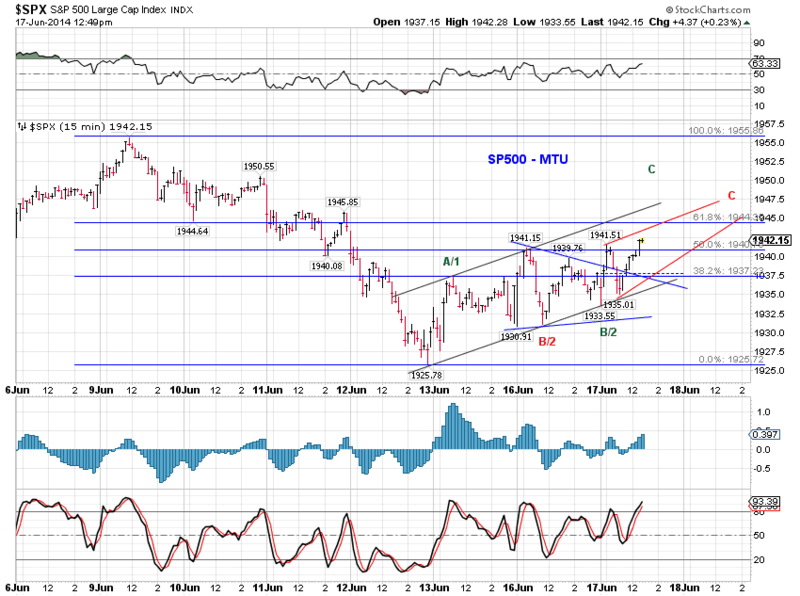 Otherwise, wave C-down is likely to break the February low (1739.66 in SP500). 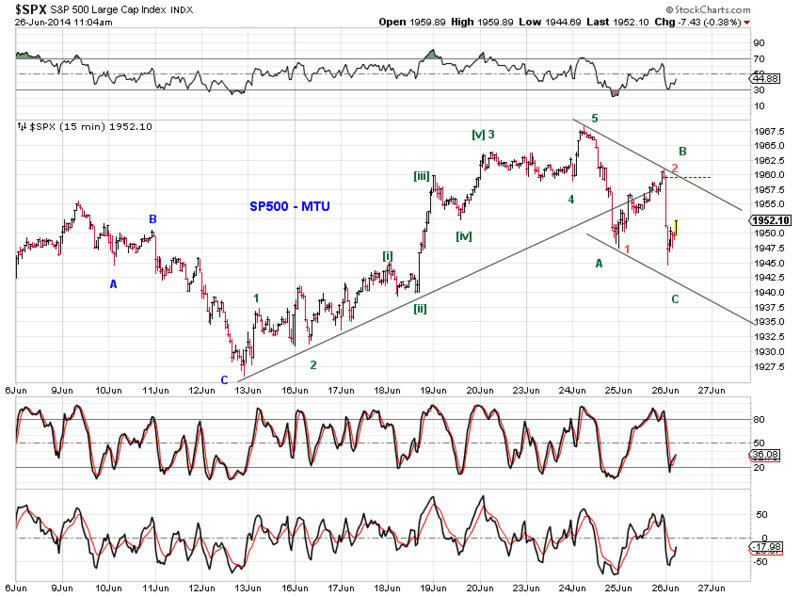 Chart 4 shows how this expanded consolidation can fit into the larger count as a wave (4)-down. 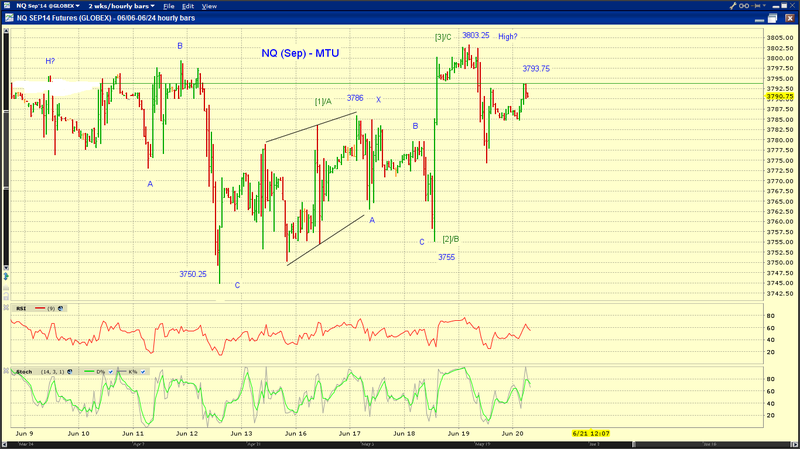 NQ hints at a potential pullback at the moment. See charts. 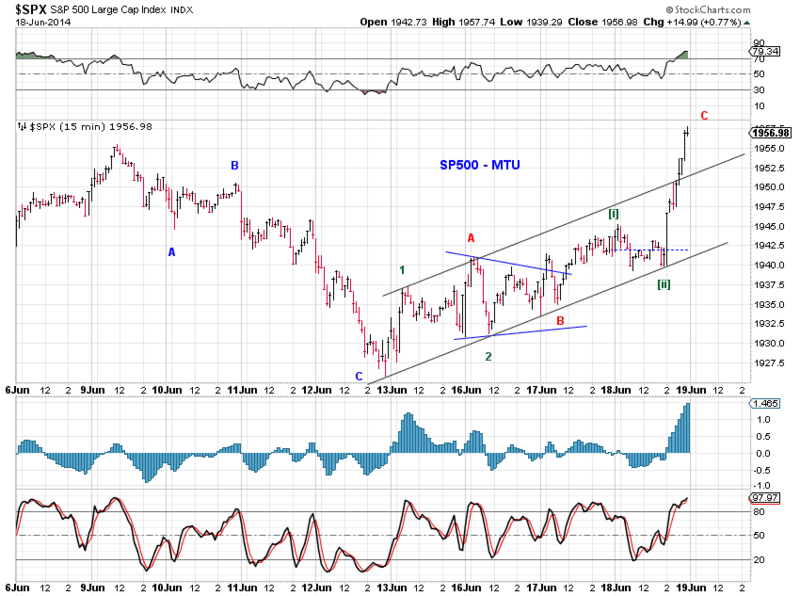 New highs in several stock indexes post FOMC. 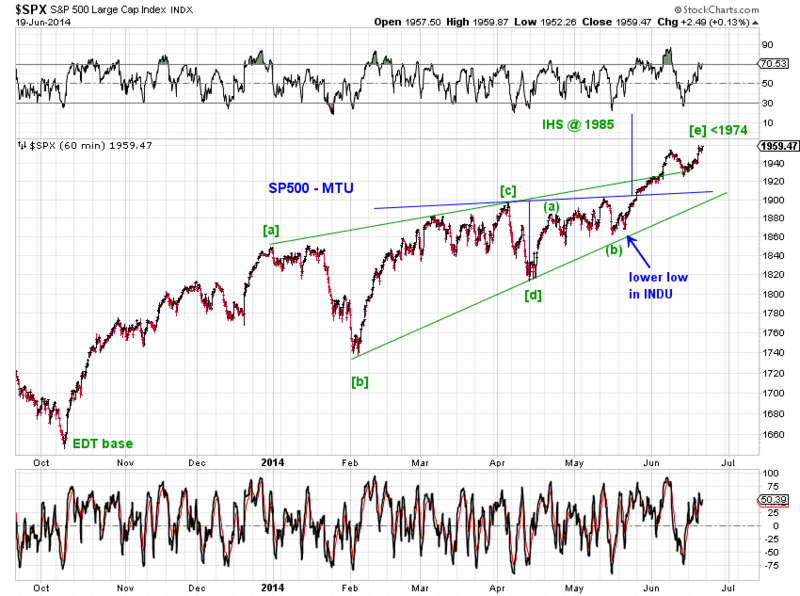 New record high in the midcap index (Chart 1), SP500 to follow? 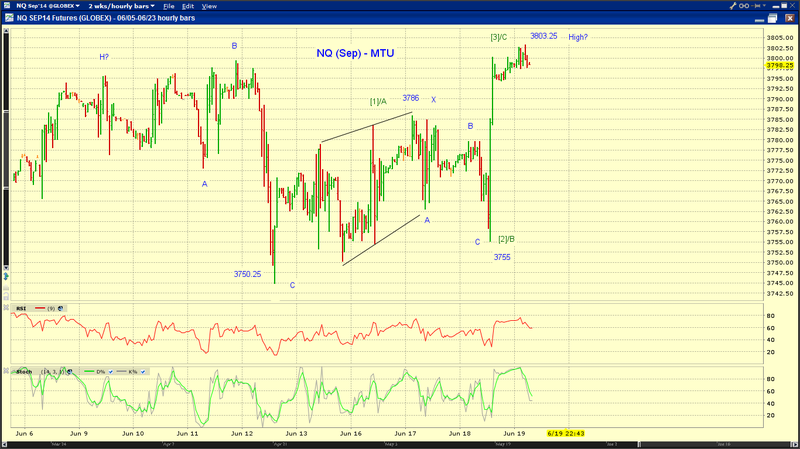 Chart 2 shows squiggle tracking on SP500.